I haven't gone as insane this year as I usually do for Fresh Hop beers. I think it's the early arrival of the season -- the slow trickle of fresh-hop creations kept the pressure from building up to intolerable levels. Deschutes Fresh-hopped Mirror Pond: Stellar, my new favorite. Drink it. Now. Deschutes Fresh-hopped Hop Henge: They've been playing around with Hop Henge for most of this year. Now with Fresh Hops? An amazing tour de force. Full Sail Lupulin: The 2007 champion (brewed that year with Amarillo hops). Of the three hops tried in 2008, the Nugget variety was best. This year I've tried the Crystal-hopped Lupulin, and it's another winner. Excited to try the other experiment: Cascades. Bridgeport Hop Harvest: Tastes a lot like Lupulin to me. Which is a good thing, letting the sweet fresh hops do the work. Laurelwood Fresh Hop Bale Pale Ale: Light and crisp, with the honeyed green-hop flavor that is called for. Hopworks Bike Beer: An IPA with some freshly-picked hops in it. A lovely beer, one of my favorites at BikeToBeerFest. Deschutes Hop Trip: Another perennial favorite. Once the FH Mirror Pond is gone, I'll start in on this Crystal-hopped beauty. So far the most disappointing fresh-hop beer for me has been the Rogue Chatoe Wet-Hop. Not at all a bad Pale Ale, just lacking the crazy fresh flavor. It is impressive that they make it with hops they grew themselves. A couple other also-rans were Hopworks' other fresh-hop ales: the Fest of Fury, and Sodbuster Pale Ale. Fest of Fury is a lovely, malty beer, but for heaven's sake, stop wasting fresh hops on it. The other flavors in that beer carry the day -- just make it a year-round beer and put the fresh hops into a lighter beer. The Sodbuster was pretty good, but it was outshined by the Bike Beer. Another Laurelwood offering -- called Fresh Hop Organic Goodness -- is a nice hop bomb, but the fresh flavor is clobbered by the overall hoppiness. Our work isn't finished yet. The Mutt was not yet on at the Lucky Lab earlier in the week when I was there, but I'm eager to try it since the sweat of my own brow went into the hops for it. I haven't hit Roots, Widmer, Lompoc, or Rock Bottom yet for fresh-hop ales, and of course there is the Fresh Hop Festival Saturday the 10th at Oaks Park. If that wasn't enough, Angelo has some seldom-seen fresh-hopped beers lined up as part of Brewpublic's 1st-anniversary party at Bailey's. Fresh-hop beers from Upright, Barley Brown's, Vertigo, and Standing Stone?!?! That's ridiculous Angelo, are you trying to kill us? One more thing: if you buy a growler of fresh-hopped pale ale, and have a little left when it's past its prime, don't forget that the original Stale Pale Ale Martini was made with Laurelwood's Hop Bale. I had a flat Lupulin Martini the other night, and it was fabulous. Life is short. Stop and smell the fresh hops. I have never heard of fresh hops beer before. I guess you learn something new every day. 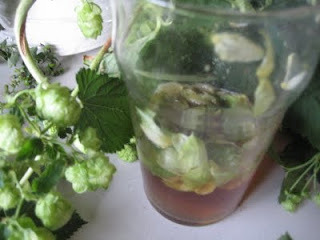 I'd never heard of "fresh hopped" beer before, either, until I ran across your blog. Interesting post. Thanks! Coincidentally, I just (semi-accidentally) picked up a bomber bottle of Harpoon's 100-barrel "Wet Hop," which would appear to follow this style. Will be writing about it soon in my blog. I haven't seen or tried it this year, but last year I thought that Sierra Nevada's fresh-hopped beer was one of the best offerings. I am a fan of the whole class, though: it's great to see brewers emphasizing the aromatic and floral components of hops in their presentation. Tastes differ, but Sierra's fresh-hopped beers don't do much for me. Last year's Chico Estate almost worked. I'll definitely give it a try this year to see how it goes. Okay, that's weird. 20 minutes after making that last comment, I went to Vincente's Pizza for lunch, and they had Sierra Nevada Harvest on tap. So I tried it. It's a nice beer, but with so many startlingly good fresh-hop beers in Oregon, it's almost beside the point.